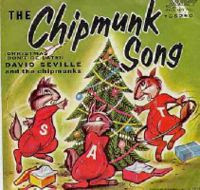 choir croak out them goodies: "I don't want your crummy gifts," said Alvin. "I don't want your crummy gifts," said Alvin. Baked goods and KRTH's "38 hours of Christmas oldies" aside, I've been finding more and more each year that Christmas is about the most depressing holiday of the year. This is sort of a common fact - at least in bad, seasonal romantic comedies, anyway - but the fact hadn't quite hit me until returning to Los Angeles in a post-college, adult state last year, when it first became necessary to budget gifts below rent and acknowledge that parties (particularly of the office or reunion varieties) eventually become something to dread. These are the trivial things, though. I don't like to talk much about my personal life here, but in a post of such downer material, I should note that my only close family nearby are my (divorced) parents, meaning that I've learned to embrace the Jewish deli on Christmas, and furthermore, that I'm an Atheist and as such have no need to celebrate the baby Jesus, however adorable he might have been in his manger. In any case, it's around this time of year that I come to wish I'd once adopted religion or some sort of strong identity; outside of Christmas, you've got Chanukah, almost comedic for the images it evokes of dreidels, prayers spoken with lots of hacking noises and gentiles who can't spell "yarmulke." You've got Kwanzaa, born out of pride and begun on a day that no one seems to remember. And the fasting period of Ramadan, when homeless people can laugh and point and say, "Ha! Get a taste of starvation now, suckers." But Christmas, a designated Christian holiday, is what we non-religious folk resort to out of convenience, and out of a lack of faith, it becomes a day not associated with Jesus and thanks and family, but with obligations. You feel obligated to buy people crap because you're afraid they'll feel forgotten otherwise. You feel obligated to hold your tongue when you see the disappointment on a friend's face, because even though you racked your brain for the perfect gift and it turned out not to be what they wanted, you don't want to be the cause of a holiday fight. You feel obligated not to gag when your grandmother chews with a smacking sound, and not to feel hurt when your out-of-state grandparents send you the same generic card and check for the tenth year in a row, because you don't want to look overly sensitive in pointing out that your relatives don't care to know you. If we, the Atheists and agnostics of the world, enjoyed the holiday with the same spirit as those who celebrated a religious figure or intent, perhaps obligation wouldn't be such a burden. Goddamn you, baby Jesus. In any case, it is because of my extreme dislike of Christmas that I've chosen to acknowledge not a religious holiday but something more interesting, for which I am far more thankful: the belated December birthdays of Woody Allen and Little Richard. Woody Allen, the man who made it hip to be neurotic and bespectacled (er...him and Rivers Cuomo), turned 72 on Dec. 1. Of no other filmmaker can I claim to have seen and enjoyed over twenty films, let alone seen that many and looked forward to the twenty that remained. Little Richard, meanwhile, turned 75 years old on Dec. 5, and from his influence on the music of the Beatles and the moustache of John Waters to his appearance on Full House (as Uncle Richard! ), I'd say he's contributed to society on a much more agreeable level than that possibly-invented figure, J.H.C. So, to the suave Allen Konigsberg and fabulously flamboyant Richard Wayne Penniman, I salute you. Happy belated birthday!